The advantages of iPads and tablets for point-of-sale have been acknowledged by companies for its reliability, flexibility, affordability, and positive user experience. In an age when security is a top priority, the Apple iOS has become known for its top cyber security measures adding to the benefits of mobile POS. Smart companies are taking the benefits of mobile one major step further. Custom apps are taking the POS mobile device to a new level of associate training and communications. Those that invest in a digitally modernized and well-trained staff will excel at educating, converting, upselling and creating loyal customers. The greatest transformation is happening in industries where a well-trained associate is required including retail, hospitality, and food services. In the case of retail, E-commerce continues to boom, yet 85% of consumers still prefer shopping in stores: immediate gratification, the ability to touch and feel product, the opportunity to engage in a customer service oriented environment. According to a study conducted by PWC, 52% of consumers 18 to 34 are spending on experience-related purchases. These statistics demonstrate the importance for businesses to focus on their greatest asset: their staff. Digitally equipped associates improve customer experiences by providing the training and information access to know more than today’s mobile, “showrooming” shoppers. That learning is best provided in the manner in which most associates are familiar, comfortable and interested: app-based digital resources. What are the key elements, impacted by the use of mobile, to a successful program? Modern mobile apps are rich, interactive, multimedia communications environments that improve knowledge retention at significantly lower costs than traditional instructor-led training or binders of papers that are rarely referred to for information. Strong programs provide a platform for customer experience training, which include videos, interactive presentations and self-assessments to help consistently explain customer demographics, their journey and the role of the associate in the customer experience. Mobile apps keep associates on the sales floor, allowing them to gain knowledge IBC (in-between customers). This not only saves payroll dollars, but keeps associates continually engaged with the brand. A major factor in the success of these programs is the ability for video to be non-streaming and residing within the app. No associate wants customers to wait while information is being downloaded. Locally installed apps residing on the iPad already contain the video content, so no buffering or streaming is required. The desired video already is in the palm of the associate’s hands, unleashed instantly with just a few swipes. These advances in mobile have lead to a new category, mACP (mobile associate communication platform). In addition to non-streaming video, mACP offers a self-publishing interface, granular targeting, real-time metrics, field accessibility, instant, internal global broadcasting from an iPad or desktop, and a simple dashboard interface. Retail associates must keep on training and honing their skills with engaging, on-floor, immersive content, and constantly be kept abreast of competitive factors; product introductions; new up-selling and cross-sell opportunities; problem- solving techniques; professional and management development; the latest corporate announcements; and other communications. Instantly an employee’s receipt of these communications must be verifiable, and their achievements as well as areas for improvement identified, based on real-time metrics. The business case has been strong for app-based, interactive mobile training and communications technology deployed locally or globally to strengthen the product knowledge, selling and conversion skills of individual sales associates, without taking talent off the selling floor. Multimedia Plus fulfilled that need with the patented QuizScore app, already in use by dozens of companies. With the recent introduction of INCITE, the next-gen version of the QuizScore app, the industry’s new Mobile Associate Communications Platform category has been established. 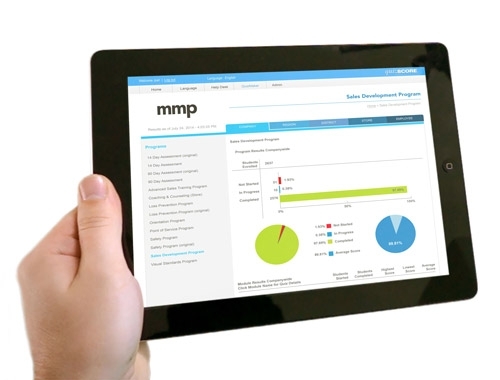 Both the mACP category and INCITE solution mark a major shift in single iPad users’ communications and training. INCITE is vigorously optimized for mobile deployment and clearly demonstrates how video communications and training can be executed intelligently, successfully, individually, interestingly, instantly, measurably and on the sales floor, across retail and other service industries. INCITE works as a private broadcast network between HQ and associates to deliver information and analytics via a dashboard interface. It is delivered on a highly secure, PCI-compliant SaaS-based platform and was developed by retail industry veterans and feedback from clients that represent some of the most popular fashion and lifestyle brands worldwide. The next-gen app also includes a Publisher tool, allowing corporate administrators to publish content including videos, PDFs, JPGs and HTML5 files directly to iPads – then monitor results in real-time. Imagine filming the VP of Stores discussing new brand features or competition, and providing it to all stores just minutes later, with full tracking. INCITE’s content is automatically and seamlessly distributed to employees based on geographic location and function. A highly branded – not merely a logo in the corner – experiential interface resonates with associates and allows them to engage in relevant communications that reflects the company’s unique culture, while driving business goals. As employees equipped with INCITE undertake brief quizzes on the short modules they’ve completed on the sales floor, in between customer time, hierarchical real-time reporting – down to the specific question – provides field managers with leading indicators to drive performance, impact KPIs, reward successes and identify improvement areas. In fact, INCITE’s real-time metrics are so targeted to the district, store, employee and question levels that some high-profile retailers are using them to change their compensation models. In addition, real-time data metrics also can indicate if in-store merchandising strategies are effective; if not, they can be switched out then reevaluated instantaneously. David’s Bridal, the nation’s largest bridal store chain, is being transformed with new products and direction, inventive marketing and selling techniques, energized store layouts, higher-end designer price points, iPad-based associate touchpoints, and a palpable allegiance to customers’ shopping journeys and dreams. The goal is to provide training to10,000 associates daily via INCITE. a 70% increase in each of the first two months, with replenishment required during the third. From POS to app-based, on-floor associate training, mobile devices are revolutionizing many aspects of the customer experience. For years, companies have been searching for technology to both provide associate with more data on the products they are offering, and recognize and reward customers as they come through the door. Mobile devices and mACP are making this possible. For more than 20 years, Dave Harouche has developed innovative, technology-driven programs for a broad range of clients, making Multimedia Plus the foremost provider of learning and communications solutions and a resource for market intelligence. Dave oversees all company operations. Prior to founding Multimedia Plus, Dave worked at Ann Taylor in a variety of roles, from systems training and support to video production. Dave earned a B.S. in Finance and Information Systems from New York University and graduated with honors from The Stern School of Business.